Known throughout the world, the works of William Shakespeare have been performed in countless hamlets, villages, cities and metropolises for more than 400 years. And yet, the personal history of William Shakespeare is somewhat a mystery. There are two primary sources that provide historians with a basic outline of his life. One source is his work–the plays, poems and sonnets–and the other is official documentation such as church and court records. However, these only provide brief sketches of specific events in his life and provide little on the person who experienced those events. Shakespeare’s father, John, came to Stratford from Snitterfield before 1532 as an apprentice glover and tanner of leathers. Sometime between 1556 and 1558 John Shakespeare married Mary Arden, the daughter of the wealthy Robert Arden of Wilmecote and owner of the sixty-acre farm called Asbies. Mary Arden lived between 1540 – 1608 while John Shakespeare lived between 1531 – 1601.John’s father, Richard Shakespeare, was a tenant farmer of Robert Arden of Wilmecote and Mary Arden was the youngest and favourite of the eight daughters of Robert Arden who was a member of the noble Catholic family of the Ardens of Park Hall whose family forebears had been given land by William the Conqueror. We assume neither John nor Mary could write — John used a pair of glovers’ compasses as his signature while Mary used a running horse — but it did not prevent them from becoming important members of the community. William Shakespeare was indeed lucky to survive to adulthood in sixteenth-century England. Waves of the plague swept across the countryside, and pestilence ravaged Stratford during the hot summer months. Mary and John Shakespeare became parents for the first time in September of 1558, when their daughter Joan was born. Nothing is known of Joan Shakespeare except for the fact that she was baptized in Stratford on September 15, and succumbed to the plague shortly after. Their second child, Margaret, was born in 1562 and was baptized on December 2. She died one year later. 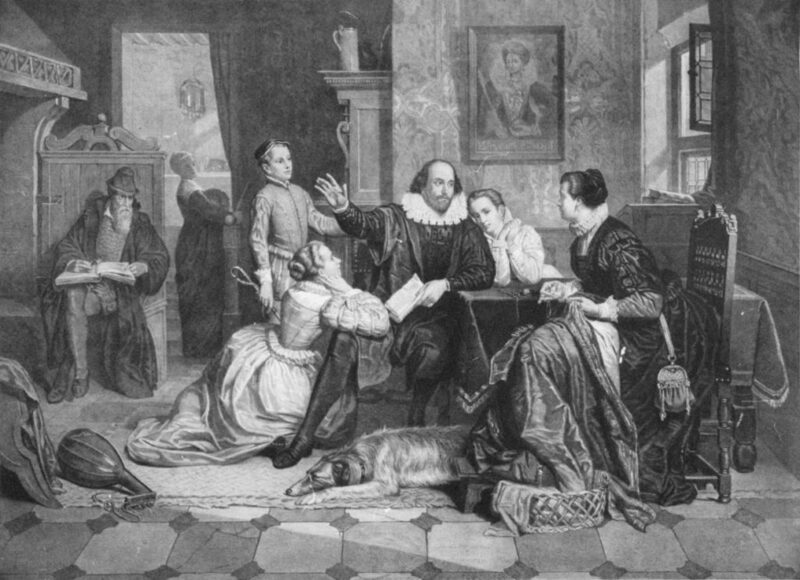 The Shakespeares’ fourth child, Gilbert, was baptized on October 13, 1566, at Holy Trinity. It is likely that John Shakespeare named his second son after his friend and neighbor on Henley Street, Gilbert Bradley, a glover and the burgess of Stratford for a time. Records show that Gilbert Shakespeare survived the plague and reached adulthood, becoming a haberdasher, working in London as of 1597, and spending much of his time back in Stratford. In 1569, John and Mary Shakespeare gave birth to another girl, and named her after her first born sister, Joan. Joan Shakespeare accomplished the wondrous feat of living to be seventy-seven years old — outliving William and all her other siblings by decades.